For most people, the beginning of February signals that Valentine’s Day is just around the corner. But for me, it signals something else as well…the arrival of tulips…both fresh and faux! They are not only one of my favorite flowers but also one of my favorite ways to add color to my home! And… they are so versatile! Just in case you are as excited about these wonderful gems as I am, I thought I would share my favorite ways to use them! I have to share my favorite first…my DIY SPRING TULIP WREATH! I can’t wait for it to get warm enough for me to put it on my front door! Doesn’t it just say spring? You will find the directions HERE. I love this one…my POTTERY BARN INSPIRED SPRING CENTERPIECE… so simple yet so pretty! And it’s perfect for Easter! A multitude of tulips fill the basket centerpiece in my SIMPLE SPRING TABLESCAPE. Add more texture with woven chargers, a bunny at each place and a pretty patterned napkin and you are good to go! It’s also easy to add a few tulips by simply dressing up their pot! In my FRENCH COUNTRY SPRING CENTERPIECE, I covered the pot with Kraft paper featuring music notes. Or add some CHALKBOARD PAINT LABELS with a happy message for a fun little gift! I also love adding them to galvanized containers for the perfect touch to my FARMHOUSE SPRING PORCH! Or fill simple burlap-wrapped vases with tulips for a POTTERY BARN INSPIRED EASTER TABLE! ...starring my collection of chinoiserie filled with white tulips! A vintage Red Cliff ironstone coffee pot also makes a pretty container for tulips...this time in red for a FARMHOUSE VALENTINE CENTERPIECE. Here it is again, this time with pink tulips and a stack of vintage plates and silverplate forks and knives in an EARLY SPRING CENTERPIECE. I've added them to my RUSTIC FRENCH VALENTINE CENTERPIECE, corralled in my favorite chippy box. Note that the photo was taken during the Blue Hour, a photographic phenomenon you can read about HERE. Such pretty table top and front porch ideas, and I finally had a chance to look at some of past weeks post. Love the all the ideas and the white snow ball was too cute. Thanks Have a Great Day! Everything you make, I love. Made the cut out valentine sheet music candles. 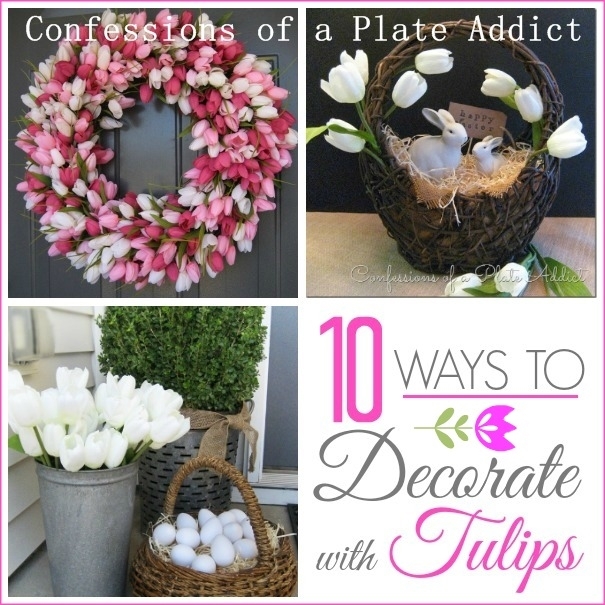 Now I am inspired to do the tulip wreath. Thanks so much for your crafty ideas.